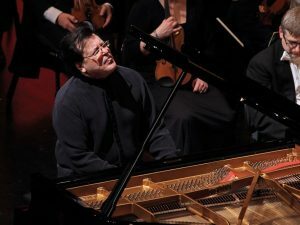 Andrei Gavrilov’s unique and unforgettable performance with the Bristol Ensemble in 2014 brought the Colston Hall to its feet in what one audience member described as ‘an explosion of delight’ following ‘an extraordinary dynamic connection with audience and orchestra alike’. Expect a similarly gripping, intense, energetic, passionate rollercoaster ride from this virtuosic Russian soloist when he returns to perform three demanding concertos in one evening – Rachmaninov’s Second, Saint-Saëns Second and Ravel’s Concerto for Left Hand. Fireworks, exhilaration and passion guaranteed.